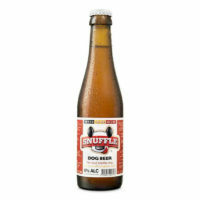 Snuffle is the world’s first dog beer. Although, it doesn't contains any alcohol and is non-sparkling, but emotionally it is most certainly a beer!! Made in the land of beer – BELGIUM, with a mission to give every dog the chance to taste and enjoy the reward she deserves. Doing everything humanly and dogly possible to bring Snuffle to each and every dog in the world, with over 1 million dogs severed and counting. And even helping the dogs that can't get dog beer, Snuffle give a generous portion of their profits to dog shelters and projects for stray dogs etc. We the humans prefer to drink beer with our pals to laugh, enjoy and share moments. Wouldn’t be great to do the same along with your best friend - your DOG? Snuffle beer is brewed with human-grade ingredients. Made from beef or chicken, malt barley extracts, mineral oils, vitamin B and other doggy goodies to twitchell the dog’s taste buds, just as our pint of beer does for us!! So next time, when you’re out in a hot summer day on the beach, or when you’re enjoying watching your favorite team play on TV, or when you’re celebrating a special occasion with loved one, don’t forgot to open a Snuffle beer to treat your best friend, he deserves.